Blocked Drain Melbourne results in slow emptying of sinks, tubs and floor drains and eventually standing water. Recognizing the signs that drains are becoming clogged and in need of attention can prevent having to call in professionals to handle the problem of Blocked Drain Melbourne. Every home should have a few tools that will help when dealing with slow emptying drains and everyone should practice preventive maintenance to keep the water moving freely. A plunger or sometimes called a plumber’s helper is a handy tool to have around the house. It can be used to force hot water through pipes as well as in conjunction with other preventive care such as baking soda and vinegar or commercial drain cleaners to remove build up inside pipes to prevent Blocked Drain Melbourne. A pipe wrench is useful for removing traps and drain pipes to clear them of debris and clogs under the kitchen and bathroom sinks. For household purposes, a 25-foot plumber’s snake, called an auger as well, to help reach, break up and remove clogs further along in a pipe. The flexible steel cable is hand cranked and bends in pipes to reach stubborn clogs. There are also augers or snakes especially designed for toilets with the end bent at the right angle to move through the curves of a toilet trap. You can also rent an electric auger that is powerful enough to cut through any clog. Care must be taken to avoid using too much force and causing damage to pipes and fixtures. If the clog remains after you hit it with your best do-it-yourself techniques, call Melbourne 24 Hour Plumbing to handle your Blocked Drain Melbourne. When you first notice slow moving water in your tub or shower, the problem may be trapped hair mixed with skin and soap scum have which have formed in your drain trap. Removing the debris from your trap and using preventive measures weekly or monthly can avoid a clog being formed in your pipes. Using the baking soda and vinegar or commercial drain cleaner in both bathroom and kitchen sinks may also prevent blocked drains Melbourne. Those slow-moving drains may also be remedied by grabbing your trusted plumber’s helper, your household plunger, running hot water with a few drops of dish soap through your pipes. Be sure to use a wet towel or rag to block the overflow hole in the bathroom or the open drain in a double sink kitchen to have the right pressure to clear the debris building up to avoid a Blocked Drain Melbourne. You may have to grab the pipe wrench to remove the trap and drain pipe under the sink, however PCV couplings may be turned by hand. To catch the water inside the pipe, have a bucket on hand. If the clog is further along in the pipe, you may need the 25-foot cable auger or snake to break it up and clear that Blocked Drain Melbourne. These preventive measures and tools may resolve you issues with a Blocked Drain Melbourne, but if they don’t and you have exhausted your do it yourself know how and still have a Blocked Drain Melbourne, called the experts at Melbourne 24 Hour Plumbing. We will be at your service with the right tools to do the job. 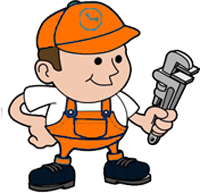 Trusted, professional, fully licensed and insured, and trained for the highest level of workmanship, Melbourne 24 Hour Plumbing is quick, safe and effective for a Blocked Drain Melbourne.